Google maintains a list of your contacts automatically if you use company products such as Gmail, Google Plus and others. This list grows over time and situations may arise where you may want to export the list of contacts, for instance for safekeeping or to import it in another program, application or web service. 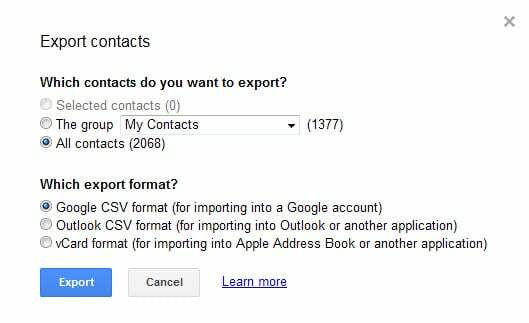 This guide walks you through the steps of exporting all or select Google contacts. You need to sign in to your Google account if you are not signed in already. Once done, all available contacts and people in Google Plus circles are listed. If you want to export all contacts, click on more on the page and then on export when the context menu is displayed. This opens the following popup menu. The two core options that you have are to select which contacts you want to export and which format you want used for that. The first option is simple: either select one of the available groups or keep all contacts selected instead. If you have selected contacts before, you can also select to only export those contacts. Google supports three export formats that you can select between. Google CSV is a specifically formatted comma separated values file that is ideal if you want to import the contacts back into a Google account. This is great for backup purposes for example. Outlook CSV is the general purpose file. It is compatible with other programs such as Outlook, and the easiest to work with in editors. vCard finally is designed for Apple products. Select it if you want to import the contacts to an Apple Address Book. If you want to process the contacts in any way, select Outlook CSV. You can load the file in Microsoft Excel, Open Office or any other program that supports CSV files to edit it there. Each contact is listed in a single row in the spreadsheet program so that it is relatively easy to remove contacts or edit information this way. Make sure you save the data as a csv file afterwards again. Other options that you have are to split files if you need to do so, or sort files and export only a selection as a csv file. This file can be imported again into a Google account or another application that supports the import of csv files. How to export all or some of your Google Contacts to edit and process them before importing them into a Google account or another application or service. Google CSV uses a weird format, I suggest you stick with Outlook CSV. Thank you, Martin, I value your advice, as always. Here in South Africa the country code is +27. The land line and cellphone numbers start with a 0 (zero). If you export it as a CSV file, the zero is dropped. Are you sure they are dropped during export and not by the program you load them in? Numbers starting with 0 are preserved when I load them in Office 2013. Martin I use Excel 2007. The number 082…4499 will show as 8.22E+08 in the “Mobile Phone” cell. If I click on the cell the value 82…4499 is shown. Joh, this is not an issue of the csv file but how Excel interprets numbers. You can modify this, see: http://www.quepublishing.com/articles/article.aspx?p=2024309&seqNum=9 for example. Joh, try right-clicking on your cell, or the column header above the cell, then choose Properties, then Numeric Format, then pick a format you like. Sounds like your cell has defaulted to Scientific Notation, which makes phone numbers look goofy. There is a Custom choice if one of the standard formats won’t work for you. Leading zeroes might disappear under any circumstances if the cell contents are considered by Excel to be a number, in which case you must put a non-numeric character in front of the digits to force the spreadsheet to see a character string instead of a numeric value. Alternatively, you can use Constraints to force character versus numeric interpretation. This advice based on Quattro Pro, not Excel, but might work for you anyway. Great post that covers the most important bases to keep your Google Contacts in order. Jumping in here with a comment in hopes that it’s valuable to your readers as well as my company has a solution to go beyond Google’s “auto-complete”. Basically, Evercontact, automatically updates all of your contacts based on email signature analysis in your incoming emails so that you’ll always have your contacts most recent telephone #, mobile, address, company, role etc. We’d be happy to set you up with a VIP trial if you’d like & feel free to reach out at anytime. The google exports only the main or first phone numbers, correct? Could somebody explain me how to fix it? I’m trying to export a contact file named “other contacts” (1963 contacts). I click on the file then go to more go export. The file “other contacts” does not show up in the drop down window. any ideas?